The town of Lexington, Kentucky, suffered a serious loss this week after a savage fire led to the destruction of countless innocent beings. And when I say beings, I mean doughnuts. 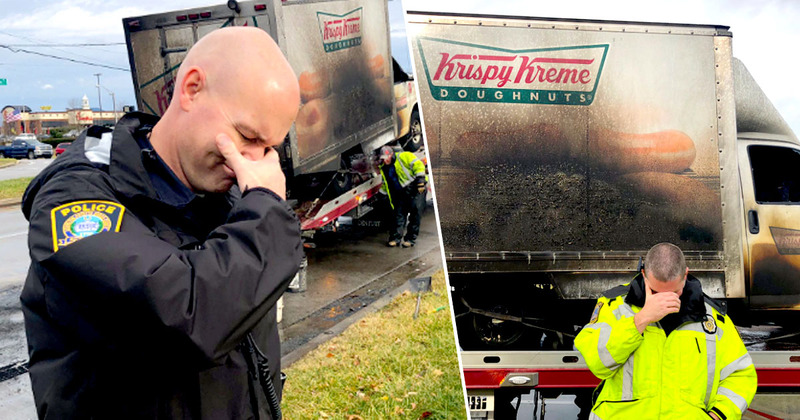 And when I say serious loss due to a savage fire, I mean a Krispy Kreme truck caught fire. No one was injured or hurt in the catastrophe, other than the morale of the local police department, who took to Twitter to express their devastation in a public outpouring of grief and emotion. We’re thinking of you during this difficult time…and have more doughnuts on the way! Thankfully, members of the community were on hand to offer their support. I can’t believe they showed pictures of the truck at the scene. Come on guys there’s still donuts burning in there have some respect and decency for the Donut Family who has to watch this…. I can’t believe they showed pictures of the truck at the scene. Come on guys there’s still donuts burning in there have some respect and decency for the Donut Family who has to watch this….My heart goes out for the family’s and officers who has to handle this horrific event. The South Dakota Highway Patrol also shared their condolences, having been through a similar series of events themselves. We feel your pain up here is South Dakota. Call if you need to talk. Lexington PD’s tweet has so far (at the time of writing), been retweeted over 39,650 times, and been liked by more than 135,000 people. I know stereotypes are most often ill-informed and out of date, but it seems police and doughnuts are destined to go hand-in-hand forever.